Nicos and all the staff were so welcoming and helpful . Pick up and drop off to the port was much appreciated . We would highly recommend this accommodation and look forward to returning some time in the future . Efaristo !!! The owners of this hotel are extremely hard working and it really shows! The place is very clean and well kept! We were welcomed by Panos at the Port who gave us useful information on the drive to the hotel. Then Nikos greeted us at the hotel Showed us to our lovely room complete with a tray of fresh fruit. They were very helpful through out our 10 day stay. We would highly recommend this hotel. Lots of great destinations to walk to and the bus stop is very handy as well as the supermarket. I cannot rave enough about the staff at Ikaros Studios. We were picked up and dropped off at the port and treated so kindly. They gave us excellent recommendations for the area and went above and beyond to make sure that we were enjoying our stay. The rooms had everything we needed and the balcony and garden area was an extra perk. Location is fantastic as well! Lovely accommodations, beautiful pool, amazing staff. Very clean and immaculately maintained. Hosts and staff are super friendly and made you feel like family. Balcony is a nice touch and the pool was fantastic. Just far enough out of town for some peace and quiet with convenience just a short stroll away. Fabulous family run hotel and spotlessly clean. Beautiful grounds and sparkling pool. Nikos and his father were very kind and picked us up from the port at the beginning of our trip. They also took us back when we needed to leave.They gave us maps and recommendations about things to do on the island, which was great. We weren't in the very center of Charo but we didn't feel left out of the action with our location. The property itself was gorgeous and we enjoyed our cozy room. We had an amazing time! Excellent location if you want to be away from the central town, but still walking distance into town and the beach. Hosts were very welcoming and informative. They were able to pick up and drop us off at the port as part of their service. The room was cleaned daily. The kids loved the pool. Wish we could have stayed longer. Lock in a great price for Ikaros Studios & Apartments – rated 9.5 by recent guests! 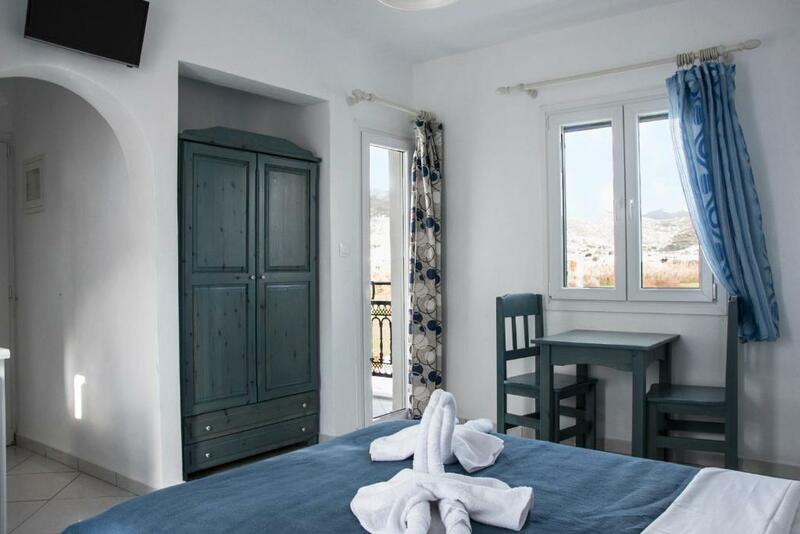 Family-run Ikaros Studios is located 2,650 feet from Naxos city and just 1,000 feet from Agios Georgios Beach. It offers a swimming pool and self-catered, air-conditioned accommodations amid beautiful gardens. 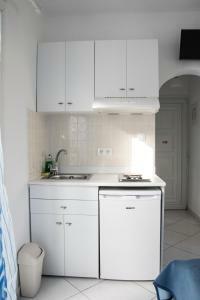 Apartments and studios feature a sitting area, and well-equipped kitchen or kitchenette with fridge. Each unit has a balcony or patio. Satellite TV and radio are standard. Water sport facilities, as well horseback riding facilities are offered. A playground area is featured on site, while free WiFi access is also available. Hotel staff at the 24-hour front desk can arrange car and bicycle rental. Naxos Airport is at 0.9 mi. Free public parking is possible on site. This is our guests' favorite part of Naxos Chora, according to independent reviews. 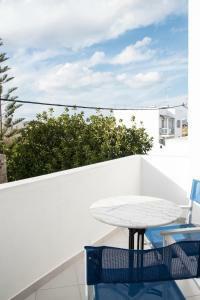 뀐 Located in the top-rated area in Naxos Chora, this property has an excellent location score of 8.9! When would you like to stay at Ikaros Studios & Apartments? 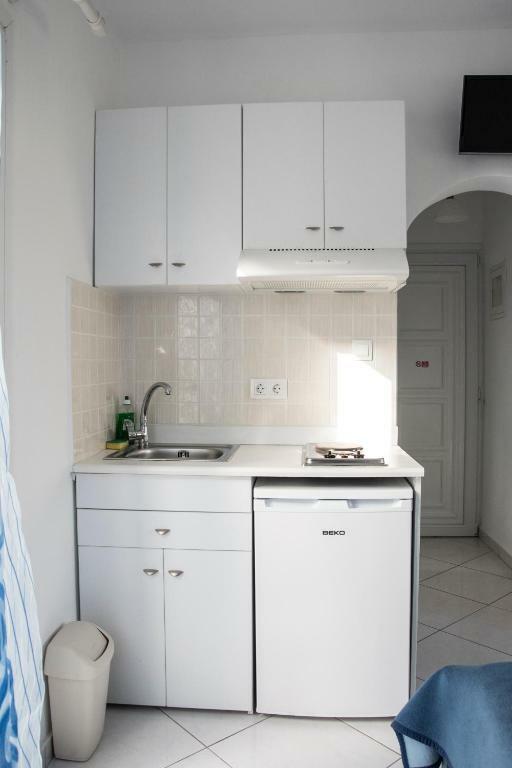 The spacious apartment consists of 2 bedrooms, a living room and a full kitchen. It opens up to a balcony or a patio. This simply furnished studio includes a kitchenette with a dining area and a private bathroom with a hairdryer. It opens up to a balcony or a patio. Ikaros is literally our home and we all have one goal, to make our guests feel like home too. We have a pool area with space for all our guests, a well kept garden and a playground. Ikaros is ran by Nikos and Kalli. We are always available and happy to answer questions and to give useful tips, suggestions and solutions. We want to make our guest's holidays in Naxos as pleasant as possible. Ikaros is located at a quiet area of Naxos town, about 800 meters (10-15 minutes on foot) from the center and 300 meters (5 minutes on foot) from the Saint George beach. The biggest supermarket on the island is located 150 meters from the studios An open air cinema, the bus stop to many beaches, a restaurant and a cafe are 200 meters from Ikaros. House Rules Ikaros Studios & Apartments takes special requests – add in the next step! Ikaros Studios &amp; Apartments accepts these cards and reserves the right to temporarily hold an amount prior to arrival. Ikaros Studios & Apartments accepts these cards and reserves the right to temporarily hold an amount prior to arrival. Please inform Ikaros Studios & Apartments of your expected arrival time in advance. You can use the Special Requests box when booking, or contact the property directly using the contact details in your confirmation. I loved my stay here. Nikos and all the staff were exceptionally helpful and friendly. Nothing was too much trouble and they were always happy to advise on where to go and how to get there. The accommodation was lovely, well-kept and extremely clean and included nice touches like a table and chairs by the front door to sit. Everything a person needs is close by, including a great supermarket and cafes/bakeries. Would definitely stay again and would recommend it to anyone visiting this island. The room was bit small but had all you need and very clean. The whole atmosphere was great. The gardens were lovely, as was the location overlooking fields at the edge of town. Very helpful staff. Just a short walk into town and a short walk to The beach. This family run property really do make you feel at home. Rooms are clean and presentable. Nice pool and quiet space for sunbathing. I wish my stay could have been longer. That the location was very peaceful yet only a 20 minute walk into the centre to explore. It was lovely to return to in the afternoon and relax beside the pool which was surrounded by a well kept garden full of colour. The staff were lovely without being obtrusive. That I stayed there such a short time. The garden was lovely and the location was peaceful. A nice walk to the main part of town. Yet with none of the trappings. This was a lovely family run hotel. The people were most welcoming, friendly, helpful and accommodating. Apartments and pool area were immaculately clean. Location was perfect, very serene with amazing views and walking distance to both beach and town. Couldn’t ask for more! We would stay here again and highly recommend staying here to any body else. Thank you Nikos and family and thank you Paulo for our transport. Early morning calls by the local rooster. Spotless in every aspect. Extremely professional in every way. Quite and peaceful. The host family are a credit to the people of Naxos. Could not use pool due to algae water problem..not the fault of owner. This was rectified and fixed though we had to go as end of our stay. The pool is great now.! The staff friendly and very helpful. This apartment is the best we have stayed in all our trips to Greece , truly fantastic with attention to detail.